Q: Do your Arks have floors, I've been told I need a floor? Q: How do I clean one of your Arks out? Q: Do your Farrowing Arks have rails inside? Q: Do I need a heat lamp inside the hut? Q: Can I paint the Arks? 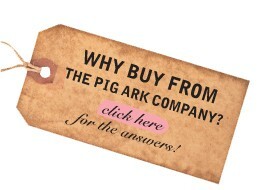 Q: How long do the Arks last? Q: Are your Arks assembled? Q: How do I calculate the right size Dry Sow Ark? Q: Which size water trough do I need? Q: What is a Creep Fender for and do I need one? Q: What benefit is an Insulated Roof on a Farrowing Ark? Q: Which size sow feeder would i need﻿ for 1 Sow? Q: Do your Arks have rails inside? Q: How long do Arks last? Q: What size Feeder would I need for 1 sow?